About four or five years ago I met a couple from church who told me about pony and cart driving, what fun it was and how the horses were so good and I would meet lots of friends. They told me I wouldn't drive on my own because I would have an RDA whip, which I was pleased with. A new challenge was set! My favourite horse is called Casper - he's lovely and good as gold, well most of the time! He was found in a back garden fed on scraps but you wouldn't know now because he is nice and cuddly now. Every two weeks there is a bus that comes to pick us all up and takes us back home again. I think this is such a fantastic service for people who are unable to drive themselves. I meet lots of lovely people and take part in competitions. My first competition was the Concours d'elegance. We drove around Windsor Park looking very elegant and we came first overall. We were all so pleased. I went on a driving holiday which was great fun, going on drives twice a day going round poppy fields and through woods which were so beautiful. I like to help towards the upkeep of the ponies by fund raising. Once a year we go to places like Waitrose and go down Ascot High Street with Casper - the little children stroke Casper while Mums and Dads give me some money. Good team work! Take every opportunity when it comes. Matthew is 27 years old and he has always loved horses. Matthew began riding at Bank Farm near Chesham with Anne Coney. He was diagnosed with epilepsy when he was 18 years old and we thought he would not be able to ride again. When I heard about carriage driving Matthew was very excited at the possibility of being involved with horses once again. Matthew has a MENCAP carer who brings him from Chesham most Mondays which is his favourite day of the week. 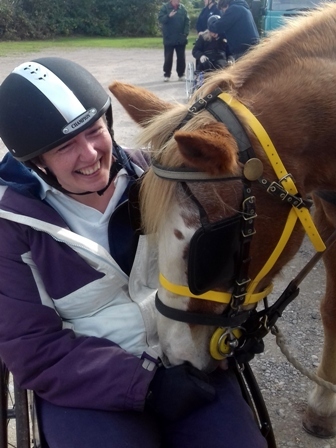 Matthew is very shy and has many difficulties, his carriage driving has given him confidence and he has made many wonderful friends. He has enjoyed some lovely trips with the group - he has been to the Royal Mews (shown here with Terry Pendry, the Queen's stud groom), Christmas event at Windsor Castle and Christmas dinners in Windsor Great Park to name just a few. I would like to thank everyone involved in the driving group - Matthew and myself are so grateful that he has been given this opportunity.